LEGO Minifigures Series 14 Review : Monsters! The (LEGO) Monsters are coming! Lego latest Minifigures series officially known as Lego Minifigures 14 will feature a full suite of familar monsters that will thrill you to bits this coming Halloween. Personally I am a fan of LEGO especially their special theme Lego Minifigures. Our past reviews will attest to that. Usually LEGO Minifigures will comprise of minifigures of various themes. Series 14 is a little special as it has a common theme attached to it... MONSTERS. 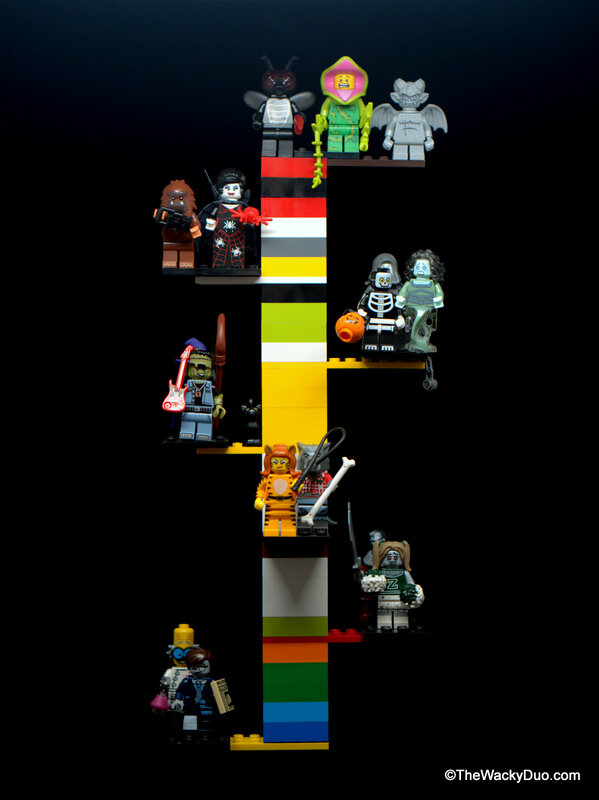 This series brings you the best compilation of minifigures in Monster form. From werewolf to zombies to ghouls to witches, you have a scary ensemble of LEGO Minifigures to scare the bejeeners out of everyone. We bring you a quick guide to the Minfigures offered plus we give you some tips on the best (and cheapest) way to collect these minifigures in Singapore. A Werewolf in Hillbilly clothings. Before he was transformed , he was probably known as Kel. It comes with a distinct wolf head and a long bone. Those combine with the tail will give you a clue when it comes to the search for it. It is similar to the Tiger Woman but you can tell the difference from the long bone it carries. It comes in 3 in a box, making it a pretty rare find. Ahoy, the Zombie pirates have landed. The Zombie pirate would be at home in a Pirates of the Caribbean Set. It's quite similar to a generic pirate and comes with a hook and a captains hat. The Hat and sword are dead giveaways. Feel for a small ring (the collar) to confirm. The 'wooden' leg is particular to this minifigure too. It comes in 5 in a box, making it one of the easier one to secure. I am crazy and I got a fly potion that will turn anyone to the FLY! This nerdy mad bloke has an interesting selection of parts. Contrary to my expectation, the elongated head can be detach to two , thus allowing you to the part for other character. It's fly potion is the item to feel to confirm you got the right guy. He comes in 5 in a box, so it is not a very popular scientist. Beware of the Wacky Witch of the East. The Witch is not a new addition to the minifigures series world, bit it is different from the earlier versions with its green facade. The Witch comes with a companion and she is the only one in the series with a pet. The distinct parts are the Cat, the brown Stick and the large hat. She comes in 3 in a box, making it a much sought after witch. The plant Monster is not a man in a plant suit. Instead it was the product of a bad experiment that allowed the plan to grow hands and legs. As it's appetite grows, it decided to take its first human course for lunch! It has the largest head in the series. The addition thorns will help in identifying it. It comes in 4 in a box, but would be highly sought after due to its unique characteristic. Rumored to be the creation of Monster Scientist, this giant fly is one that you will find hard to swap. The head is unique to Minifigures and this would make a possible army builder contender. It comes in 4 in a box, but would be highly sought since it has a unique headpiece and potential army builder. Boo.oooo..ooo.. who's afraid of the big bad ghost. Ok , it isn't big, but it is sure scary. One of the better ghost found in LEGO Minigifures universe. Feel for the hood and the distinct 'leg' piece. The chain will help you differentiate from the Banshee. It comes in 4 in a box, but would be highly sought after given its relevance to Halloween. There are 3 zombies in this series, 2 of them seems to have stepped out of the set of The Walking Dead and somehow found its way into this series. The Zombie Cheerleader is cheering for her favourite team, the 'Z' ! The poms poms and the pony tail head will set this Zombie apart from the rest. It comes in 3 in a box, making it a very popular cheerleader. Watch out Tiger Moms, there is a new Tiger Woman in town. Like most costume characters of LEGO Minifigures series such as Series 13 Unicorn Girl or LEGO Movies Panda, this Tiger Woman will be one of the star of the series ( READ : Very sought after) . For collectors or flippers, this is the one to cat get your hands on. She will be quite similar to Wolf Man with its tail and big headpiece.The whip will be the one to tell them apart. She comes in 3 in a box. Together with the penchant to collect costume characters, she will be a rare find! The Gargoyle is a standard feature in any Gothic building. Think Batman Gotham City or the majestic Gothic Churches. It comes in 4 in a box, making it fairly easy to find. This is not a real ghoul or monster. It is the only real guy in the series dress up like a skeleton. The Pumpkin and the handle are your only cues to getting this minifigure. He comes in 4 in a box, making it fairly easy to find. Would wants to rock our with Monster Rocker Frankenstein? It comes in 5 in a box, making it easy to find. For fans of TWD ( The Walking Dead, not The Wacky Duo) , this is a must have. One of my personal favourite due to the office attire that I identified with. Plus I am a huge fan of TWD! The Zombie Times that comes with it is a must read for Zombie fans! The 2x2 tile is only available for this minifigure. Feel the briefcase for confirmation. It comes in 3 in a box, making it one of the harder ones to find. Its similar to the Spectre, so be careful when it comes to choosing it. The head piece is rough compared to the Spectre's smooth Hoodie. It comes in 3 in a box, making it rare and desirable. No Big Foot here, but Square Foot ( which we think it is one and the same) You might be wondering why the camera, we suspect it was probably nicked from a camper who wanted to take the Square Foot photo. If you stare closely, you might find the Square Foot resembles his distant cousin , the Yeti from an earlier series. The big head and the camera would be the items you would be looking for in the search for Square Foot. It comes in 4 in a box, making it a breeze to find. Say hi to the extremely elegant Spider Lady. She does not have any love connection with Spiderman. On the contrary with her fangs, it would be no surprise if Dracula is her lover instead. She is truely one gorgeous babe that even the wife fancy her. She is the only one with the big dress in this series . The 8 legged Spider would help too. It will not be hard to identify her. She comes in 3 in a box,so finding her might be quite a challenge. The thrill of getting the full set on your own is the search for it. 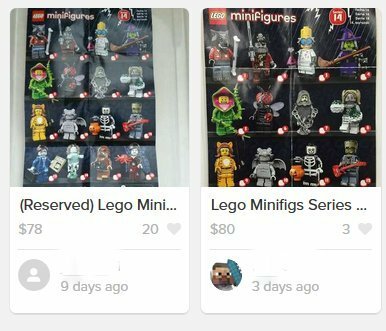 However with the ever growing popularity of LEGO, this might be a tough route to take as the popular pieces will often 'disappear' very quickly if open. There are good buys from Carousell. If you get it early, you still can get a decent set at $80 . Since the retail price is $4.90 a piece, you are paying close to retail price. Do get it earlier as price tends to appreciate after a few weeks .